Making history in Athens: Those attending the international conference in the Greek capital on Tuesday afternoon witnessed a truly historic event – a handshake between the president of Iraq and Israel's minister of defense. Minister Ehud Barak, who is participating in the gathering of the Socialist International congress in his capacity as chairman of the Labor party, warmly shook the hand of Iraqi President Jalal Talabani. The two were then joined by Palestinian President Mahmoud Abbas, who also extended his hand to them. Talabani, 75, took office in April 2005 and previously served on the temporary council established in Iraq following the downfall of tyrant Sadam Hussein's regime. He founded one of the largest political parties for Iraqi Kurds – the Patriotic Union of Kurdistan (PUK). For years he was an activist fighting for Kurdish independence in Iraq, eventually ending the separatist campaign after signing a truce agreement with Hussein's Baath party, which ruled the country until the US invasion. 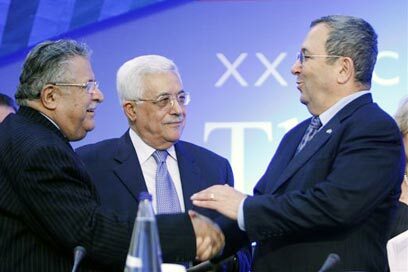 Barak also sat down for a meeting with Abbas, reiterating Israel's willingness to make "painful concessions" for peace and expressing his hope that progress will be made in the ongoing negotiations with the Palestinian Authority. "I hope the time for decisions ends when the two leaderships, particularly the Palestinian one, reach a political breakthrough," said Barak. The defense minister also briefly addressed the Iranian nuclear threat, the same day Pentagon officials voiced their concerns an Israel attack on Iran's facilities was imminent and would perhaps be carried out by 2009. "The Iranian nuclear program poses a challenge on a global scale, and I will say nothing further," said Barak. See all talkbacks "Barak shakes hands with Iraqi president"